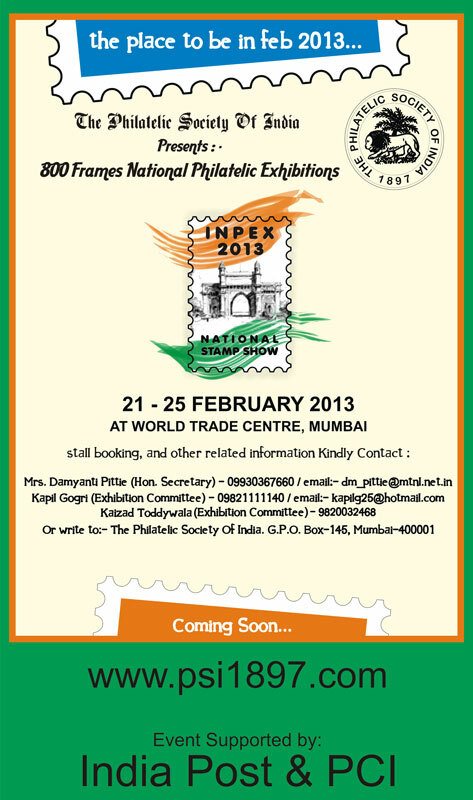 INPEX 2017 is hosted by the PSI in Mumbai with the support of india Post & the patronage of the Philatelic Congress of india in Mumbai from 30th November to 4th December 2017, @ The World Trade Centre, Mumbai. Please refer to the links below for information on the various aspects of INPEX 2017 and ways to participate along with requisite forms. Forms can now be filled and submitted online from the website directly. Copy of each filled form is emailed to the participant along with a unique reference number. Please quote this reference number for all future communications. if you would like to volunteer to help organise before or during INPEX 2017 please do get in touch with us. Please feel free to email us at contact@psi1897.com or call on +91-9819850349 with any questions your may have.